"Move In Ready in Great Location!" Bedrooms: 3 "All Spacious with Great Closets!" Size: 1,794 sq. 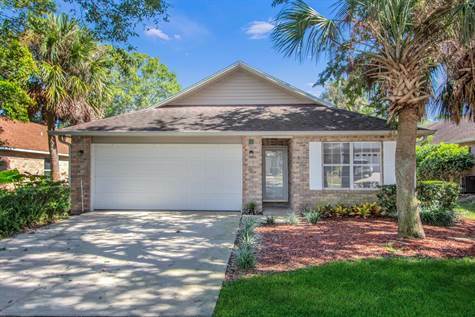 ft. "under air/2695 total"
Located in gated Reflections Village this 3 Bedroom/2 Full bath home on a very small cul-de-sac, has vaulted ceilings & is bathed in natural light throughout. Enter into a large open Great Room with Eat-In Kitchen beyond. Kitchen includes white cabinets, large pantry & is light & bright with views of the private, huge Screened Lanai. Master Retreat has loads of closets & an amazing 5 piece ensuite Bath. There are Split bedrooms, Built Ins, a roomy Inside Laundry Rm and so much more. Affordable HOA covers gated entrances & lawn care so this property offers the Easy Florida Lifestyle you have been looking for in a sought after location! Situated right in the midst of Everything Ormond Beach has to offer, like: Daytona Beach International Airport; institutions of higher learning; restaurants; shopping; major roads; hospitals; museums; & of course the 'World's Most Famous Beach.' And a quick 1 hour drive to Orlando attractions too! Move in ready, this is a great home for retirees, first time buyers, families & investors. New interior paint, carpet, refrigerator, lanai screens, and more. All measurements are approximate & home is selling as is with inspections gladly welcomed.